Khalil Rountree Outstrikes Eryk Anders, Four Knockdowns In The Second Round, What A Great Fight! UFC 235 PPV (pay-per-view) event is happening now (Saturday, April 13, 2019) from inside State Farm Arena in Atlanta, Georgia. Welcome to the 205-pound clash between the former inaugural LFA Middleweight champ Eryk Anders and TUF 23 finalist Khalil Rountree Jr.
Our ref is Jason Herzog. Here we go! Fighters touch gloves. Both fighters are southpaws. Low kick Khalil. Khalil misses with a right low kick. Rountree feints a lot, moves around his rival. Again a low kick attempt. Wow, now a brutal front low kick and a rear low kick, Rountree holds a typical Muay Thai guard, his front foot is on the tips of the balls. Great low kick again, but missed by a hair. Khalil misses with a right hook! Low kick. And another one. It seems this right low kick had to hurt, Anders is not moving well! Strong right hand Khalil. Anders’ right thigh is already red. And another low kick, this is not looking good!!! The crowd starts to boo! Brutal right low kick Khalil, but misses with a big punch! Anders slipped away! Another punch Rountree. And another low kick to the inside, this looks very bad for Anders. Low kick Rountree, followed by a middle kick. And again a brutal low kick to the front leg. Left low kick Rountree. Middle kick, this was brutal, followed by a knee to the body, Anders is getting battered! High kick attempt Anders, hits the opponent’s head. The end of the round, 10-9 Rountree, Anders has walking issues! Anders’ corner demands better movement and more action. Fighters touch gloves again. Brutal low kick, and amazing combo Rountree. 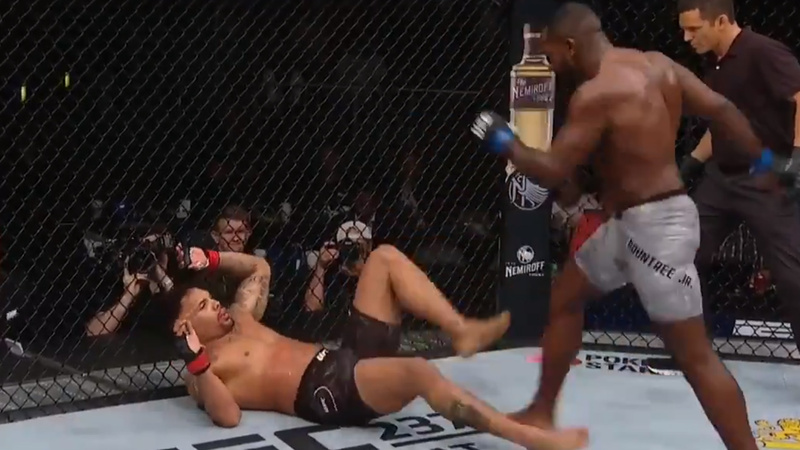 Brutal left hand Rountree, Anders goes down, now Khalil kicks his legs. Amazing hammer fists, but Rountree lets him up. Low-kick missed by a hair. Brutal left hand, and a kick to the head, but Anders protects his head well. Rountree kicks his legs again. Anders goes for a takedown, but Rountree sprawls like a pro and defends. Superb combo Rountree. This body kick landed. Anders goes for a left high kick. 1-2 combo Khalil. And another left hand. Wow, what a combo Rountree, it was 3 or 4 punches, brutal right hand sends Anders to the ground! Rountree kicks his legs again, but lets him up!!! Right high kick Anders. Wow, what a brutal right middle kick to the body Rountree. Low kick. An outstanding right hand to the face, Anders goes down, Rountree is not interested in fighting on the ground, he kicks his rival to the legs. Herzog orders Anders to get up. Left high kick Anders. Right hook followed by a left hand Rountree. It seems Khalil doesn’t want to finish this fight. 10-8 Rountree. Anders’ corner orders him to go for a body lock take the fight to the ground. The doctor looks at Anders and lets him continue the match. But his right leg is heavily hurt. Anders is warned. 1-2 combo attempt Rountree. Middle kick Khalil. Great low kicks. Anders misses with a left hand. Great right hook Khalil. Rountree misses 1-2 combo. Jab to the body Khalil, followed by a low kick. 1-2 Anders. 1-2 Rountree. Wow, Anders went for a takedown, stopped by a punch, I have never seen this before, amazing way to defend a takedown. Right high kick attempt Rountree. Left low kick Rountree. Right hook, middle kick Rountree. Right hook Khalil. Anders attacks with a combo. Anders misses his rival over and over. Right high kick Anders, missed by a hair. Both fighters seem fatigued. Low kick Khalil. Great clinch exchange. The last minute of the match. Jab to the head Khalil, followed by a superb combo, but Anders slips away. Amazing left uppercut Anders, this had to hurt, but Khalil fires back with a left hook. Low kick followed by a high kick. 10-9 Anders. Eryk Anders drops to 11-4 MMA, 3-4 UFC, Khalil Rountree improves the score to 8-3, 1 NC MMA, 4-3, 1 NC MMA.